Chennai, Sep 14 (IANS) The Madras High Court on Thursday ordered that a floor test should not be held till September 20 for Tamil Nadu Chief Minister E.K. Palaniswami to prove his legislative majority. The court passed the order after hearing the petitions filed by the DMK and sidelined AIADMK leader T.T.V. Dinakaran. 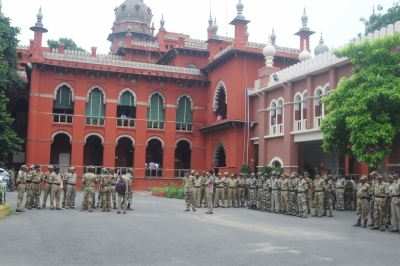 The court asked the government counsel whether action was being contemplated by the Speaker against the 19 legislators belonging to the Dinakaran group who have revolted against the Chief Minister. The government counsel submitted that action against the Dinakaran group lawmakers had begun and that the court could not intervene at this stage as it was the Speaker’s domain. The DMK and the Dinakaran faction fear that the Speaker would act against the 19 lawmakers so that the government wins the floor test. The 19 lawmakers have submitted a letter to the Governor withdrawing their support to Chief Minister Palaniswami. They have asked the Governor to initiate the process to install a new Chief Minister. Speaker P. Dhanapal has also issued notices for breach of privilege to the DMK MLAs for displaying banned tobacco product “gutkha” in the assembly. In the 235-member Tamil Nadu Assembly, there are now 234 members including a nominated member who does not have voting rights. One seat is vacant since the death of Chief Minister J. Jayalalithaa last year. Effectively, the number of legislators with voting rights in the assembly is 233 and the half-way mark 116. The number of legislators opposed to the government is 119 — including 98 of the DMK and its allies and the Dinakaran faction’s 21. “The ruling party has the support of only 114 legislators,” DMK leader M.K. Stalin has said.